Complete Electronic Job Sheets & Rectify Any Issues That Arise Without Delay. For a 14-Day Free Trial, click here! 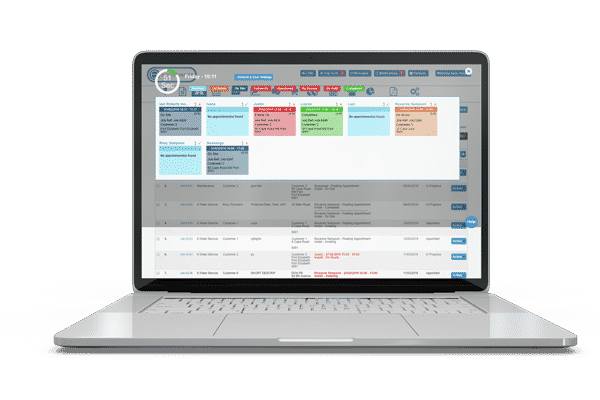 A Full Featured Field Service Management Software System Designed to Manage and Streamline Your Entire Business from Start to End. Keep Track of All Aspects of Every Job from One Place. Field Service Management Software is an all in one system to help you as a business owner or administrative staff keep track of your field operatives. It’s important to keep track of your staff when out in the field, losing valuable man hours is the main cause of jobs running over schedule. With Eworks Managers Field Service Management Software you can keep track of all aspects of every job, all from one place. When jobs are assigned to workers out in the field, every action made is monitored and tracked within our FSM Software. This allows your scheduling staff to know every job that been assigned to each worker. Your admin can also see the range of jobs done by each worker for reporting purposes by simply inputting a date range. As every job is tracked, the office is kept informed so that if the customer happens to call in, your staff have the answer of the whereabouts of the worker, the progress of the job and any other relevant information relating to the job. When it comes to job sheets, Eworks allows your workers to capture a customer’s signature from the mobile App. The Eworks admin system and mobile App work in conjunction with each other. This means that every action that takes place on the App, whether your staff action that they are on route, if they add any notes or photos, or when they get the customers signature on the job sheet. The system automatically transfers all information from the mobile App to the admin system in real time. The Geo Planner will show your office a real time location of your field workers that use the mobile App, this means that your office will know exactly where your workers are at any given time of the day. With an all in one Field Service Management system like Eworks Manager, you can quickly see which jobs are taking longer than what they need to and the reason behind it. Usually, workers would need additional parts for a job, or they are abusing the time spent on site. As and when jobs are updated from the field, your office staff can view and monitor photos of work done, thus they are able to see the progress of work as well as any notes added by the worker explaining what the delay is. If parts need to be ordered in to complete the job your field staff can action this from site which sends an automatic notification for your office to order in the additional parts. This saves time having your workers come back to the office and makes sure everything that is needed to complete off the job is made available as soon as possible. Time management is vital when you have teams out in the field tending to a handful of jobs. Eworks' FSM System will let you set up your specific jobs and attach default completion times to them, your office can then easily schedule and assign jobs to those technicians who will be available during the day. The Time Planner in the admin system shows a live and visual representation of all jobs for the day, the week or the month. This will allow your office to easily schedule jobs for your workers without creating duplicate or double bookings. By scheduling jobs effectively, time management is made efficient. When jobs are complete, on hold or handed back to the office, the live notifications, as well as the live panel in the admin system, will assist your office in becoming efficiently reactive. With the live panel, you can have a screen in your office which will display a live feed of where your workers are up to with a specific job. This makes sure that as soon as a job is complete, the designated person in the office can authorise the job and make sure it is sent for invoicing immediately. This leaves no time for jobs to be forgotten about or misplaced while you wait for your worker to bring the job card back to the office. If you would like to book in a demonstration of our software get in touch today, or register for a free trial to test it for yourself.